Having limited access to Wi-Fi and cell phone service we didn’t realize we would be spending International Women’s Day volunteering at the sanctuary. It couldn’t have been more cosmic. The strength of the women around us joined together with some good ol’ fashion teamwork and we have been able to complete any task we have been given the past few days. We started our day with a jungle trek. Just like Baan Dada, there is a daily schedule but we never really know what we are doing. They just tell us how to dress. We started the trek thinking maybe we were going to find the elephants. 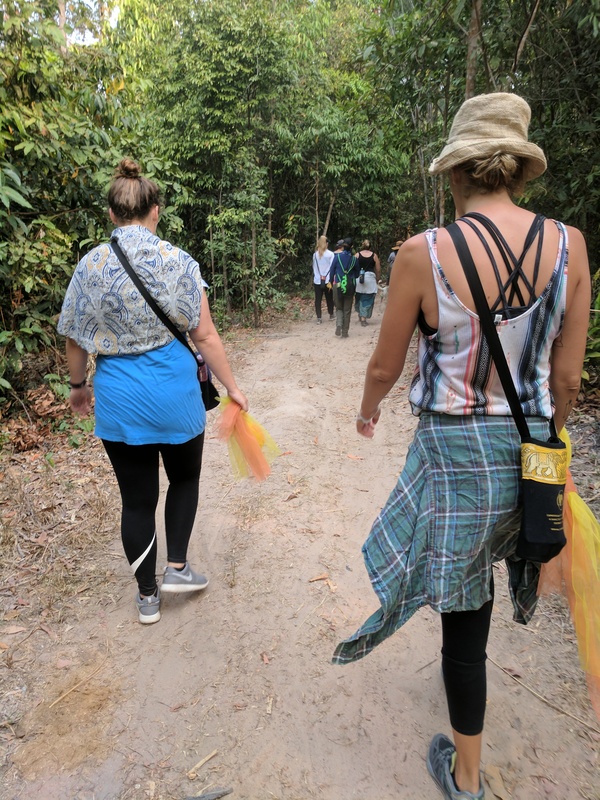 We were given a yellow and orange piece of tulle and were guided by Chan and an armed ranger in the front and back of the line of women. Two hours later, through the jungle, we passed a massive black spider, a rooster high up in the tree, and some edible leaves and flowers we were able to taste. We arrived at an old bridge that had been burned. Chan informed us that poachers had burned the bridge in retaliation towards CWS for destroying their animal traps. One of the dogs got stuck in one of those traps close to the dam we fed the elephants in yesterday. The dog unfortunately lost his leg but strong as he is, he is still running around the sanctuary faster than some of the other dogs. Then, we were told to cross the dried up river and pick a tree or two to bless so they will not die, be torn down, or burned. Mel chose a tree with three limbs to represent Becca and the Gypsy Givers. She also chose another tree for her nephew, Otto, and blessed it in honor of his second birthday today. I chose a tree with swirly vines because I am craving pasta (the heat is making me delusional) and to me it represented this crazy adventure we are on. Becca chose the one she was leaning on because it was the closest to her and provided a crutch after such a long hike. 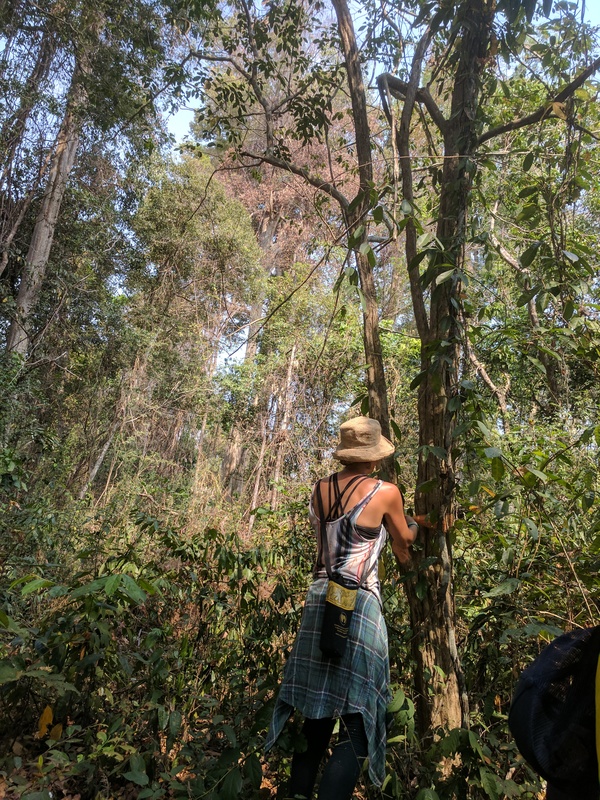 Although the jungle is part of a wildlife refuge area there is still logging and poaching that occurs illegally and we did this to help protect the vital trees within the jungle. We hiked back to camp, in the 95 degree heat, for lunch. 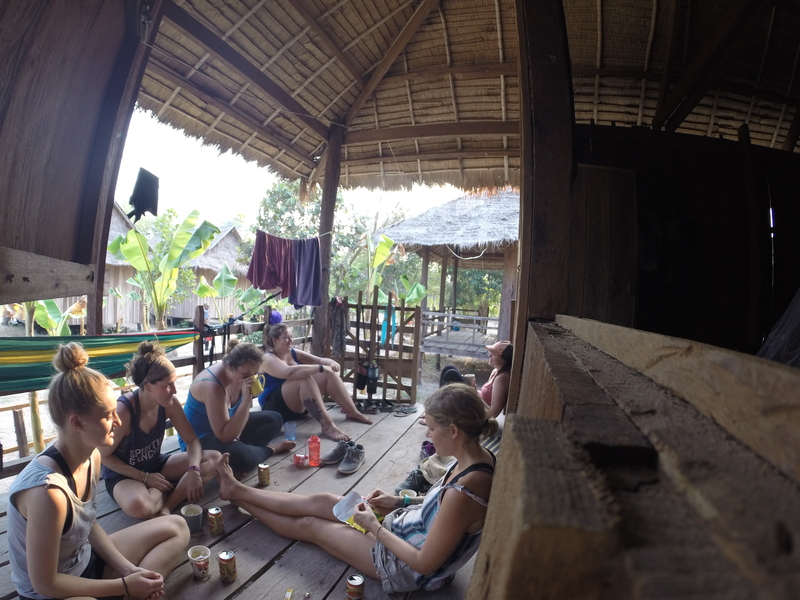 We continued with our daily chores of cleaning the jungle shelter and cutting the banana trees with a machete. We can cross that off the list of things we’ve done that we never thought we would! 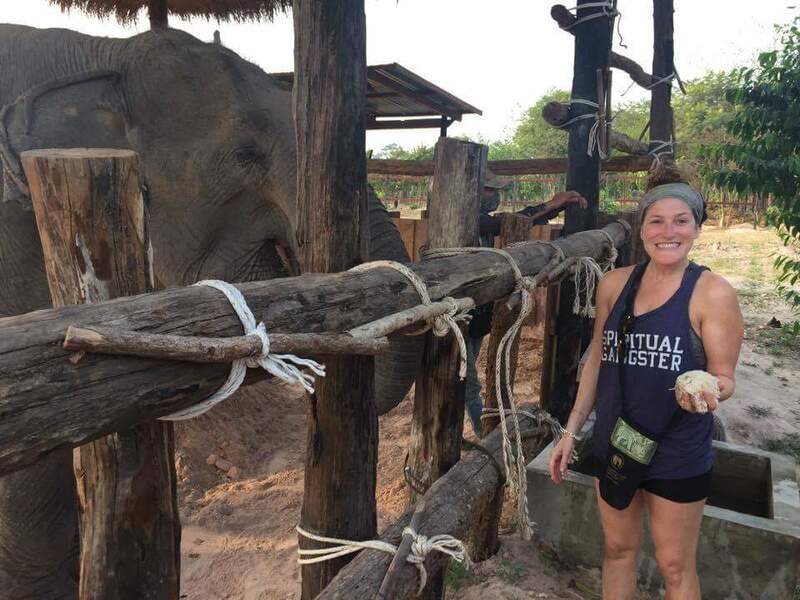 We made food for the elephants. Mel, Becca, and I got to feed Khamlin, again. She is still my personal favorite. We were exhausted between the hard work, heat, and hike. We were so stoked for the ice delivery, our daily beer, dinner and documentary. We watched Back into the Wild and CWS Fires. It was valuable to learn more about what we saw on the hike. The vegetation was burned around us but we just thought it was from their controlled burnings. There are huge, old trees missing part of their trunks. The fires burned from February until May, only just a year ago. It was started from a poacher camping in the woods and not putting out the fire properly. It very well can happen any day here with the dry brush. The trees are precious for the wildlife in Cambodia and so much of them are being destroyed from logging. We can happily say the wildlife refuge is doing their best to preserve what they have.